Don’t you just love a comforting, warm dinner on a cold autumnal evening? Have a go at making this onion and herb toad in the hole – it’s sure to be a crowd pleaser. Toad in the hole: 1 pack of 8 sausages (approximately 450g); 2-3 red onions, cut into wedges; 3 tbsp vegetable oil; 230g plain flour; 1 whole egg plus 3 egg yolks, beaten; 340ml milk; ½ pack of fresh rosemary (leaves only). Onion gravy: 1 tbsp butter; 2 large onions, thinly sliced; 2 tbsp plain flour; 400ml vegetable or beef stock; a splash of Worcestershire sauce. 1 Preheat the oven to 220°C (fan 200°C/gas mark 7). 2 Sift the flour into a bowl. Make a well in the centre and add the beaten eggs. Mix together, adding just enough milk to make a paste. 3 When all the flour has been incorporated, whisk in the rest of the milk to make a thick batter. Leave to stand whilst you cook the sausages. 4 Place the sausages and onions in a roasting tin with the oil. Cook in the oven for about 10-15 minutes. 5 Pour over the batter then sprinkle over the rosemary leaves. Return to the oven and cook for 20-25 minutes. 6 Whilst the batter is cooking, turn your attention to your onion gravy. Heat the butter in a saucepan until bubbling and then add the onion. Cook gently, stirring often, for 10-12 minutes or until the onion softens and caramelises. 7 Sprinkle the flour into the mix, stir and simmer for 1-2 minutes. 8 Slowly stir in the stock and add the Worcestershire sauce. Bring to the boil, then reduce the heat and simmer until the sauce thickens. 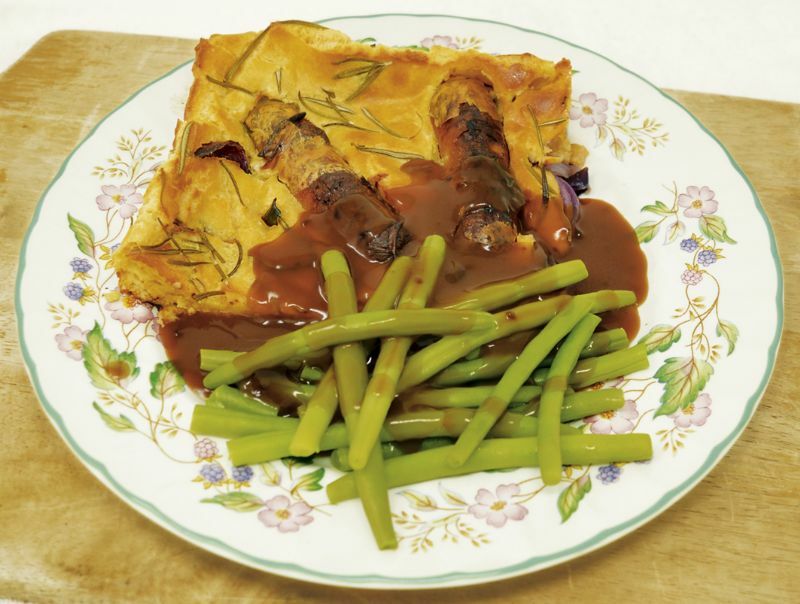 9 Serve the toad in the hole with seasonal greens such as broccoli or green beans, as well as a healthy drizzle of your rich, piping hot onion gravy.